Hello world! Leye Daniel; a passionate and ready-to-work designer, very creative and professional in creating un-plagiarized Mobile and Web UI UX Designs. I have worked with clients...Read moreHello world! 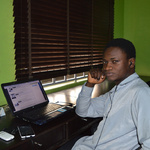 Leye Daniel; a passionate and ready-to-work designer, very creative and professional in creating un-plagiarized Mobile and Web UI UX Designs. I have worked with clients from around the world (Iceland, Australia, Nigeria, USA). I am ready to make my clients/buyers happy with their experience with me. What I need is a chance and what you need is a trial to convince you. I use Adobe XD for my UI UX Designs, other software will be on request (Figma, PS, AI). WONDERdesigns is my brand and I am here, up and running to help my clients and of course, make some cool cash.